It has always been our ambition to be able to report to people a review of the day, week, or month ahead of the earthquake situation across the planet. This will happen I think this is now feasible. 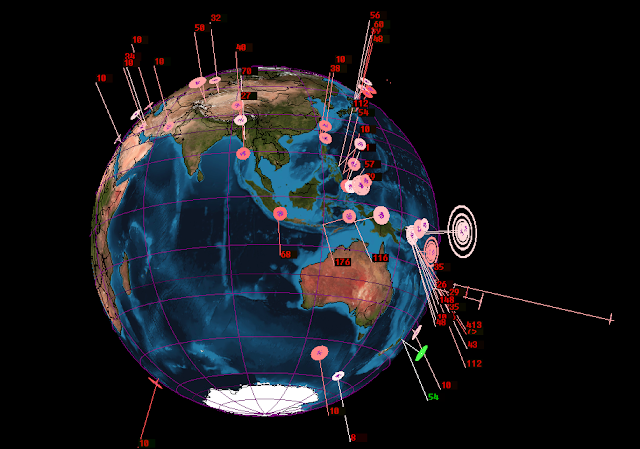 Like weather reports, we will try to present to you for now daily the global earthquake 'weather' report, just like the weather forecast, a forecast of our predictions of all the possible vulnerable places on earth for some seismic events. For now we do it daily in order to optimise things. We will see if we can do more detailed ones later. We still expect tomorrow to see some doubles, (this is two earthquakes in the same location of same magnitude) again, like we did today. Although we plan to polish this report up, however for now we focus on coordinates to check some of our ideas. We do not give too much emphasis on picking up the strongest. We test a few things so we often get small ones, as well as stronger events. Using our methods we can deduce that for tomorrow, 23rd January 2017 that we have the following countries/regions of vulnerability for an earthquake event. Chile (19S, 70.5W) we expect a strong event here.